John Steinbeck is one of the most popular and important writers in American literature. Novels such as The Grapes of Wrath, Of Mice and Men, and East of Eden and the journal Travels with Charley convey the core of Steinbeck’s work—fiction that is reflective and compassionate. The Nobel prize winner cared deeply about people, and his writing captured the spirit, determination, and willingness of individuals to fight for their rights and the rights of others. His art of caring is critical for today’s readers and as a touchstone for our collective future. 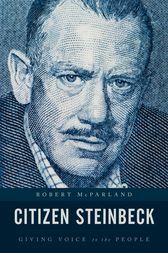 In Citizen Steinbeck: Giving Voice to the People, Robert McParland explains how the author’s work helps readers engage in moral reflection and develop empathy. McParland also looks at the ways educators around the world have used Steinbeck’s writings—both fiction and nonfiction—to impart ideals of compassion and social justice. These ideals are weaved into all of Steinbeck’s work, including his journalism and theatrical productions. Drawing on these texts—as well as interviews with secondary-level teachers—this book shows how Steinbeck’s work prompts readers to think critically and contextually about our values. Demonstrating the power a single author can have on generations of individuals around the world, Citizen Steinbeck enables readers to make sense of both the past and the present through the prism of this literary icon’s inspirational work. McParland provides a comprehensive overview of the life and work of John Steinbeck (1902–68). Yet, what makes this critical study different from other treatments of the novelist is the emphasis on what McParland calls 'the public value of Steinbeck’s work' and 'what readers today may discover in his stories.' The author is particularly interested in how teachers instruct their students to value the relevance of Steinbeck’s novels to their lives today, especially such classics as Of Mice and Men, The Red Pony, The Pearl, and The Grapes of Wrath. McParland’s work is up-to-date; he mentions the 2016 presidential debates and Republican presidential candidate Donald Trump to emphasize the pertinence of Steinbeck’s social and ecological views, and why it is important to teach his literature. The author analyzes not only Steinbeck’s fiction but also his nonfiction to illustrate how he addressed the controversies of his day. VERDICT This fascinating study is recommended to anyone curious about the significance of Steinbeck the man and the writer. For all library collections. Robert McParland is professor of English and chair of the Department of English at Felician College. His books include Charles Dickens’s American Audience (Lexington, 2010) and Beyond Gatsby: How Fitzgerald, Hemingway, and Writers of the 1920s Shaped American Culture (Rowman & Littlefield, 2015).